Yes, you have read right! A null nutritional value sweetener which is sweeter than sugar. Stevia has 0 kcal energy, 0gms of carbohydrates, 0gms of proteins, 0gms of fats yet a very sweet product and gained popularity in foreign countries. Let’s find out more about Stevia. The active compounds of stevia are steviol glycosides (mainly stevioside and rebaudioside), which have up to 150 times the sweetness of sugar, are heat-stable, pH-stable, and not fermentable. Stevia’s taste has a slower onset and longer duration than that of sugar, and some of its extracts may have a bitter or liquorice-like aftertaste at high concentrations. IN DIABETES: Research has shown that stevia sweeteners do not contribute calories or carbohydrates to the diet and do not affect blood glucose or insulin response, which allows people with diabetes to consume a wider variety of foods and comply with a healthful meal plan. IN WEIGHT MANAGEMENT: The intake of added sugars has been shown to contribute an average of 16 percent of the total calories in the American diet and has been linked to weight gain and adverse effects on glycemic control. Plant-based, zero calorie stevia can be part of a well-balanced diet to help reduce energy intake without sacrificing taste. IN BLOOD PRESSURE: Certain glycosides in stevia extract have been found to dilate blood vessels, increase sodium excretion, and urine output. In higher doses, stevia could potentially help lower blood pressure. The plant may have cardiotonic actions, which normalize blood pressure and regulate heartbeat. Stevia’s green leaves are naturally sweet. 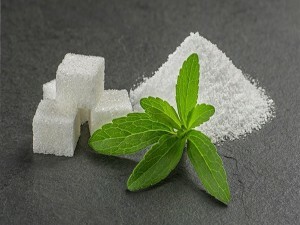 However, those white powder and clear drops we find in groceries have very little to do with stevia leaves. They aren’t really stevia at all. They’re an extract that’s been super-refined using toxic chemicals, bleach, and marketed as “healthy”. When you look at the chemical refinement process, stevia is no more natural than Aspartame, Splenda, NutraSweet, Equal, Sweet N Low, etc. Everybody is looking for a non-addictive, healthy sweetener. But, beware of any sugar-free sweetener that gives you the illusion of a “free ride”, because you may just be deepening your addiction. Green leaf stevia is the least processed of the stevia types. The leaves are basically just dried and ground into powder form. This is the type of stevia that’s been used in South America and Japan for centuries as a natural sweetener and health remedy. This type of stevia is about 30–40 times sweeter than sugar. Wow!!! Now that’s something I’ve always wanted!!! I’ve got those taste buds which sense nothing but sweet. This blog is real helpful for me…If you add on as to how to use these leaves?? Like grind them…boil them….or what??? And is it available here in Hyderabad, India??? Unique stuff….thankful…looking forward for more! All the best! This is such an informative and educational blog post! Thankyou for sharing this with us! My question is -if i want to add this in tea or milk as substitute to sugar then how can i use it?also in other sweet dishes how can i replace sugar with stevia? Hi sheetal…you can grow the plant in your backyard and can add one leave for preparing tea..for usage in sweets boil the leaves and take out the extract..hence it can be used as syrup.